Whether for cappuccino, caffè latte or latte macchiato, with the timelessly beautiful stainless steel accessory from the ZACK design brand, the milk is frothed in next to no time, ensuring perfect coffee enjoyment. 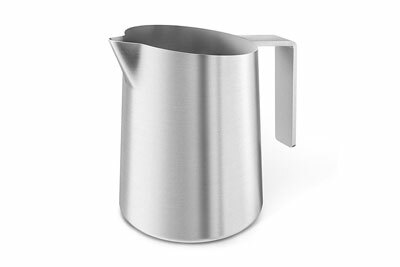 Impressive with its simple, clear-cut design and high-quality finish in 18/10 stainless steel, the jug blends in effortlessly with a wide variety of bar and kitchen furnishings. The typical ZACK brushed satin finish completes the exclusive look. This entry was posted in News and tagged accessories, coffee, kitchen, Stainless Steel, Zack on April 18, 2013 by Andy. The Nespresso story began 23 years ago with a simple but revolutionary idea - to create the perfect cup of Espresso coffee with exquisite crema, tantalising aroma and full-bodied taste - just like skilled baristas. As the worldwide pioneer, Nespresso redefined the way coffee lovers around the world enjoy their Espresso coffee through a unique combination of premium quality Grand Cru coffees, smart coffee machines and exceptional customer services. And now, to complement this truly huge international phenomenon in coffee, Zack has designed and released its Tondo Rotating Capsule Holder. Nespresso machine owners clearly demand the best and Zack is no slouch in providing just that in all of its designs and products with the Tondo being no exception. Outstandingly stylish as well as brilliantly practical. True Zack design expressed in this rotating Nespresso capsule holder. It will look fabulous in any kitchen standing proud next to the Nespresso machine. This entry was posted in News and tagged coffee, kitchen, Zack on April 22, 2010 by Andy. What a clever idea! How many times have you hunted for that coffee scoop that you know is in the cutlery drawer "somewhere"? It's sorted. Zack has come up with a novel idea to attach the scoop to your coffee canister so that you know exactly where that scoop is, this time and every time. A silicone band, complete with a scoop fixing, is placed around your coffee canister. In reality it may be a "posh" elastic band but they say that the simple ideas are always the best and this would seem to fall directly into that category. The scoop itself is manufactured in Zack's trademark 18/10 stainless steel with a brushed finish. It has a standard 7.5g capacity and the whole thing even comes gift boxed. A great and slightly unusual gift idea! This entry was posted in Product Reviews and tagged coffee, Stainless Steel, Zack on January 25, 2010 by Andy. From the beginning of the 1950s to the present day, Bialetti has manufactured over 200 million coffee-makers. In particular, the Moka Express stands out as a masterpiece of industrial design, a real "cult object" that allows millions of consumers to enjoy great Italian coffee. The inspiration behind Alfonso Bialetti's first creation was an early washing machine made up of a boiler and a tub for collecting hot water and Moka Express was developed on the basis of this principle. Since that almost legendary insight, Crusinallo-based Bialetti transformed itself from a small half-craftsmanlike workshop into one of the most appreciated and well-known companies not only on the domestic but also on the international market. Suffice is to say that in Italy alone 90% of families own a Bialetti product, the proof of a tradition that projects itself into the future with a clear objective: quality to the benefit of the consumatore! The product range offered by Bialetti coffee is a rich and comprehensive line of products "for all needs and all tastes" and it continues in the mythical Moka Express tradition - high technology and a winning design! Alfonso Bialetti's original claim of his Moka stated that: "without requiring any ability whatsoever" one could enjoy "in casa un espresso come al bar" (an espresso in the home just like in a [coffee] bar), is still true today. Not only is the Moka simple to use, but its also quick and convenient. Available in both three and six cup versions it's a must-have kitchen accessory for anyone who likes good coffee. This entry was posted in Product Reviews and tagged Bialetti, coffee on January 19, 2010 by Andy. The new Francis Francis X7 iperEspresso machine from illycaffè is sure to delight anyone who unwraps it this Christmas. For any coffee aficionado or gadget devotee, no ordinary coffee machine will do. However, while most of us can only dream of owning expensive espresso makers, the new Francis Francis X7 makes authentic Italian espresso at a fraction of the cost. Designed by the esteemed Italian architect Lucca Trazzi, the Francis Francis X7 uses the unique illy coffee iperEspresso method to create perfect, full-bodied espressos. The X7 also allows you to adjust the length of their coffee, so whether your morning calls for a short ristretto or a taller lungo, your coffee will always be the perfect size under its thick, long-lasting crema. The traditional steam wand is also perfect for creating cappuccinos, lattes and, on those rare days when coffee doesn’t feature on your menu, even hot chocolate. With its exquisite good looks, and innovative new approach, the X7 will add a sleek and polished look to your kitchen and deliver perfect coffee, long after Christmas is over. The X7 is available in red or black from www.espressocrazy.com. This entry was posted in Product Reviews and tagged coffee, kitchen on October 7, 2009 by Andy. Serve Your Cappuccino Like a Professional Barista! One of the nice things about visiting the ever growing number of coffee shops is having your cappuccino served up with a cocoa pattern stencilled on the froth! Now you can do this yourself at home and impress your family and friends by serving them coffee that could have come from a professional barista. La Cafetière's neat little stencil set is just what you need. Five stencils in different designs to suit your mood or the season in a compact storage tin so that you don't lose them will have you finishing off that cappuccino with a professional flourish! 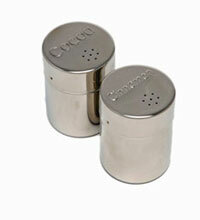 Marry this with the Cocoa and Cinnamon Shaker Set also from La Cafetière and you are good to go! The Set of two stylish shakers is manufactured from high quality stainless steel and each shaker is embossed with 'cocoa' or 'cinnamon'. Eat your heart out Starbucks! Both items are available online from Proleno. This entry was posted in Product Reviews and tagged coffee, La Cafetière on February 9, 2009 by Andy.